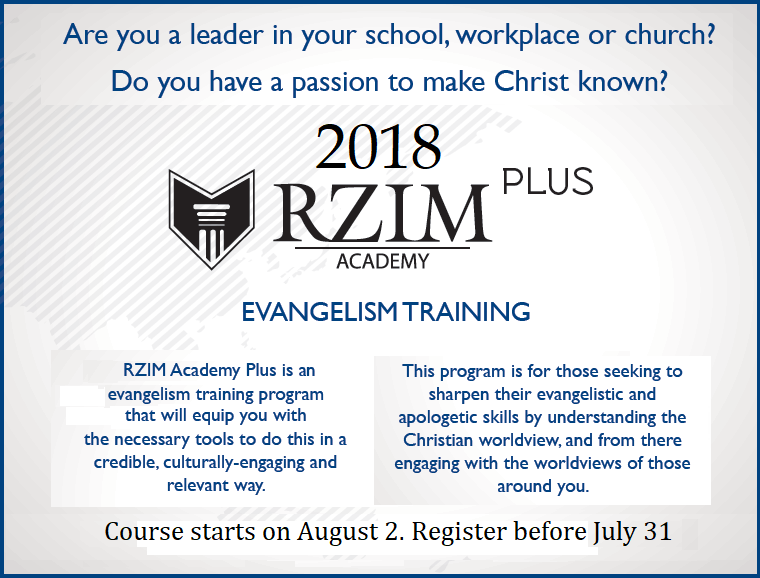 The RZIM Academy Plus is an Evangelism Course designed to equip and raise evangelists and apologists who can engage, defend and communicate the Gospel with the sceptics and learned. It is an online training curriculum followed by 6 group discussion sessions to help individuals become better equipped to give an answer to anyone who asks them to give a reason for the hope that they have in Jesus. Submit the registration form, endorsement letter from Church Leadership and registration fee of USD100 personally delivered by hand to the NECF Office at 32, Jalan SS2/103, 47300 Petaling Jaya, Selangor before 31 July. Once an application is accepted and approved, NECF will inform the applicant via email and the RZIM Academy will activate his/her online account for the applicant to start the online course on August 2.